You are not required to provide the Personal Information that we have requested, but, if you chose not to do so, in many cases we will not be able to provide you with our products and services or respond to any queries you may have. There are many aspects of this Website which can be viewed without providing Personal Information, however, for access to future TicTocTrack customer support features you are required to submit Personal Information. This may include but not limited to your contact information including email address, demographic information such as your postcode, a unique username and password, or provide sensitive information in the recovery of your lost password or other information relevant to customer offers. If you are under 18 or equivalent minimum age in your relevant jurisdiction (for more information see Age Restrictions on this Website), do not send any information about yourself to us, including your name, address, telephone number, or e-mail address without your parental or guardian consent. In the event we learn that we have collected Personal Information from anyone under the age of 18 or equivalent minimum age in your relevant jurisdiction without your parental or guardian consent, we will delete that Personal Information as quickly as possible. If you believe that we might have any Personal Information from or about anyone under the age of 18 or equivalent minimum age in your relevant jurisdiction without parental or guardian consent, please contact us at enquiries@tictoctrack.com.au. The Parent may contact us to access, rectify, delete and/or restrict any Personal Information we have collected from the child, or to withdraw permission for us to collect any additional information from the child (see “Accessing Your Personal Information” section below). Please contact us at enquiries@tictoctrack.com.au if you have questions about your child’s account. We may occasionally hire other companies to provide products and services on our behalf, including but not limited to information technology consultants to provide hosting, support and development services in relation to our systems and databases, handling customer support enquiries, processing transactions or customer freight shipping. Those companies will be permitted to obtain only the Personal Information they need to deliver the products and services. We take reasonable steps to ensure that these organisations are bound by confidentiality and privacy obligations in relation to the protection of your Personal Information. We also use third party providers to facilitate certain communications on our behalf, such as mail-outs, which requires them to access contact data. All such third parties are vetted by us to ensure they provide adequate levels of security when processing data. In some circumstances, we may need to share your Personal Information where necessary with other third parties (including legal or other advisors, regulatory authorities, courts and government agencies) to enable us to enforce our legal rights, or to protect the rights, property or safety of our employees or where such disclosure may be permitted or required by law. We require third parties to maintain appropriate security to protect Personal Information from unauthorised access or processing. Internal purposes such as auditing, data analysis, customer communications and record keeping to enable us to exercise governance of rights. We may use the Personal Information to help us create, improve, operate and deliver our products and services. We may periodically send promotional emails about new products, special offers or free information about products and services which we think you may find specifically interesting, using the email address which you have provided. You can opt-out of receiving these communications at any time by using the ‘unsubscribe’ link that we provide in all emails, or by contacting us using the details provided below. We may occasionally (though rarely) use your Personal Information to contact you for market research purposes. We may contact you by email or mail for this purpose. We may use your Personal Information to customise this Website according to your interests. You can opt-out of receiving these communications at any time by using the ‘unsubscribe’ link that we provide in all emails, or by contacting us using the details provided below. For each user to reach this Website, we expressively collect the following non-Personal Information, including but not limited to browser type, version and language, operating system, pages viewed while browsing this Website, page access times and referring website address. This collected information is used solely for the purpose of gauging visitor traffic, trends and delivering personalised content to you while you are at this Website. In delivering our services, we may use the Personal Information to assist with our technical and/or customer support (for example we may use your Personal Information to verify identity, assist with identification of users, and to determine appropriate services) or to allow us to perform diagnostics on your device including historical and tracking record reports to analyse the performance of your device. The security of your Personal Information is important to us. In order to prevent unauthorised access or disclosure, we have put in place suitable physical, electronic and managerial procedures to safeguard and secure the Personal Information we collect. When you enter sensitive Personal Information (such as credit card numbers) on this Website, we encrypt that Personal Information using secure socket layer technology (SSL). When credit card details are collected, we simply pass them on in order to be processed as required. We never permanently store complete credit card details. We follow generally accepted industry standards to protect the Personal Information submitted to us, both during transmission and once we receive it and is regularly tested to ensure security provisions remain adequate. Bank account information is never accessible, either by our employees or by third parties. Data files shared by us with third parties are password protected. Unfortunately, no data transmission over the Internet can be guaranteed to be 100% secure. As a result, although we strive to protect your Personal Information online, including through use of encryption and other measures, we cannot guarantee the security of any Internet communication or transmission. If you have reason to believe that your interaction with us is not secure, please notify us of the problem immediately by contacting us using the details provided below. Prior to introducing new systems or technologies relevant to the processing of Personal Information, we will undertake the necessary DPIAs with a particular focus on any associated risks. We use traffic log cookies to identify which pages are being used. This helps us analyse data about webpage traffic and improve this Website in order to tailor it to the users’ needs. We only use this information for statistical analysis purposes and then the data is removed from the system. You have a right to access your Personal Information, subject to exceptions allowed by law. In accordance with data protection laws, the users also have the right to receive a copy of any Personal Information we hold about them in connection with the performance of our contracts with them. You may be required to put your request in writing for security reasons. We will provide the users with copies of their Personal Information in a convenient format (via electronic means or otherwise). We reserve the right to charge a fee for searching for, and providing access to, your Personal Information on a per request basis. You have the right to ask us to limit or cease processing or erase Personal Information we hold about you in certain circumstances. In responding to such requests, we will communicate to the user concerned the impact of such restrictions or deletions. We take reasonable steps to ensure that the Personal Information we hold about you is accurate and up-to-date and we will comply with any requests to rectify any inaccurate Personal Information we may hold about you. We do ask that you notify us immediately if you change any part of your Personal Information, so we can update our records. You have the right to object to this Website using your Personal Information on the basis of its legitimate interests and the right to ask us not to process your Personal Information for marketing purposes, where relevant (see “Use of Your Personal Information” section above). We are committed to respecting individuals’ rights. You may action your rights by contacting us using the details provided below and we will comply with your requests unless we have a lawful reason not to do so. We will endeavour to handle any requests within a reasonable period and, in any event, within thirty (30) days of the original request. if you have previously agreed to us using your Personal Information for direct marketing purposes, you may change your mind at any time by writing to or emailing us using the details provided below. By law, we may only process Personal Information where we have a legal justification or requirement to do so. How long do we retain Personal Information for? We will only retain Personal Information for as long as is necessary to provide our products and services or for as long as we reasonably require to retain the Personal Information for our lawful business purposes or comply with statutory or other legal requirements. In the event of any breach of this Website systems impacting on the security of a user’s or any other individual’s Personal Information, we will inform the affected user/s at the earliest opportunity describing the nature of the breach, the possible consequences and the measures being taken to remedy the situation in accordance with our procedures and applicable law. We have a cross-functional approach to privacy governance. Privacy governance covers all areas and includes both Personal Information and employee data. All our employees are required to take induction training on business conduct of which privacy training is an essential part. If you are unhappy with the way in which we process your Personal Information, please contact us using the details provided below. If we do not respond within thirty (30) days, or if you are dissatisfied with our response, you have the right to lodge a complaint before the Office of the Australian Information Commissioner (OAIC), the Australian data protection authority. Their contact details are as follows: The Office of the Australian Information Commissioner, GPO Box 5218, Sydney NSW 2001 Australia; Tel: +61 1300 363 992; Email: enquiries@oaic.gov.au or see their website at: https://www.oaic.gov.au/. If a complaint is able to be resolved, then the terms of resolution will be recorded in writing, signed and dated by the parties and if required provided to the OAIC. If a complaint is unable to be resolved, then we will refer the matter to the OAIC for investigation and resolution. Username, email address and phone number – For account management, contact and identification. User’s images – For use as profile pictures and device avatars. User’s password will be captured securely in the TicTocTrack Admin app. All Personal Information including location data is transferred through an SSL connection. No credit card information is captured by the mobile application or stored on the server. When the TicTocTrack watch is linked to the TicTocTrack Admin App it allows the parent/carer to monitor their family members (individual wearing the watch) activity, receive regular location updates and alerts all the time the user’s device is turned on and in network coverage. This information is NOT shared with others outside of the monitoring app user. The TicTocTrack App collects your unique user identifier and precise or approximate location information as determined through data such as GPS and WiFi positioning. During the following scenarios the watch will not send location details: no coverage, no data service on the SIM in the watch, or if you turn the watch off or the battery goes flat. Family members will receive alert notifications regarding your activity when you arrive or leave assigned location points and when the SOS is activated. The TicTocPhone Service allows TicTocTrack Admin App user’s to monitor their family members activity, receive regular location updates and alerts all the time the user’s device is turned on and the TicTocPhone app is installed on the user’s phone. This information is NOT shared with others outside of the monitoring app user. 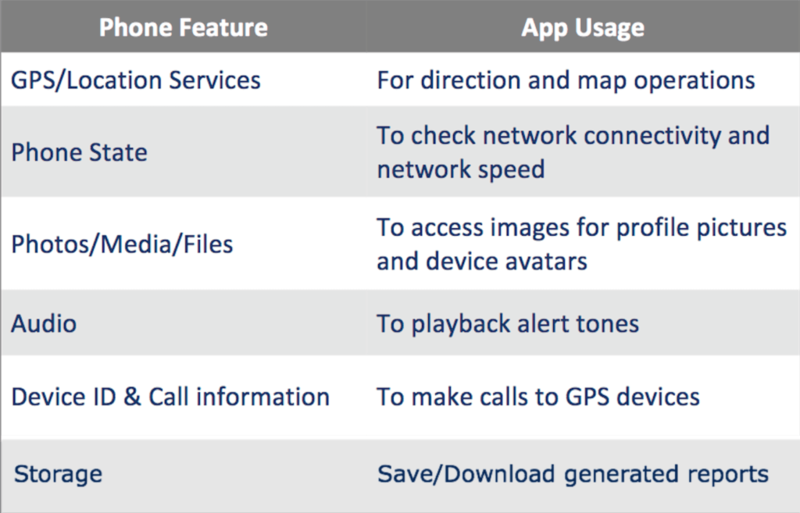 The TicTocPhone App collects your unique user identifier and precise or approximate location information as determined through data such as GPS and WiFi positioning when you have Location Settings turned on in mobile settings. During the following scenarios the phone will not send location details: no coverage, no data service on the phone, flight mode or if you uninstall the app. In addition to that iPhone users can turn off location ‘Always’ by going to settings>tictocphoneapp>location>setting to change from ‘Always’ to ‘Never’. This will stop sending location updates to the server. In Android you can go into the app and under permission user can turn off location. Family members will receive alert notifications regarding your activity when you arrive or leave assigned location points. Also, when the SOS is activated, real time tracking is turned on or off and on an Android phone, when the Sudden Impact Alert is triggered during real time tracking. If you purchase a product or service from us, we may request certain Personal Information from you. You may be required to provide contact information (such as name, Email, and postal address) and financial information (such as credit card number, card expiry date). We use this Personal Information for billing purposes and to fill your orders. If we have trouble processing an order, we will use this Personal Information to contact you. All payments are fully automated with an immediate response. Your complete credit card number cannot be viewed by us or any outside party. All transactions are performed under 128 Bit SSL Certificate. We welcome your comments, complaints and enquiries regarding these Store Policies. Our aim is to make your experience with us as enjoyable as possible. If you have any concerns at all about these Policies or your buying experience, please contact us.